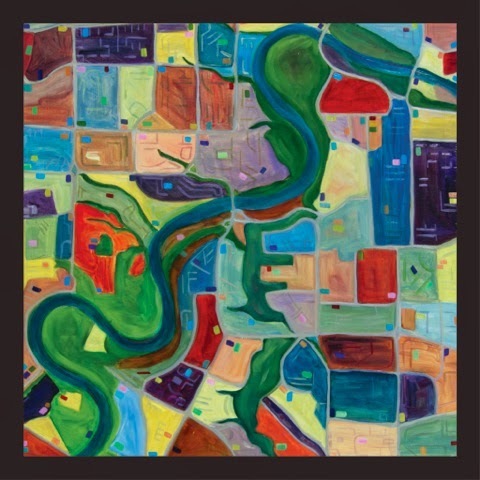 Elisa Sereno-Janz, "The North Saskatchewan River Through Edmonton (West Side)", oil on panel, 36" x 36"
Sereno-Janz says of her work: My art practice, which encompasses oil painting, fibre art, and new media, explores personal investigations in spatial, material and philosophical perspective , haptic art, and the juxtaposition of traditional art forms with technology. The intent in all of my work is to provide the viewer not only with an uncommon point of view, but also to initiate a haptic and synaesthetic response in the body. My serial work, "Rivers of Alberta" is a product of contemporary technology reworked and translated through a traditional creative practice. In Rivers of Alberta, the satellite images inspire the tradition of landscape painting. The intersection between traditional art forms and contemporary technology within my work invites the viewer to reflect on the value of maintaining an awareness of our individual lives within the vast expanse of time and change.